All my life, I have been living a lie. Okay so maybe it’s not that bad. All my life I have believed myself to be Irish. I thought I was Irish and Scottish and that’s my heritage. I romanticized the highlands and the green isle and I dreamed of going there and walking in my ancestor’s footsteps. Yes, I can still do that. Yes, I am part Irish and Scottish. I mentioned in this past post about how British I am thanks to my AncestryDNA testing. I was excited really about this. It confirmed what I was finding in my genealogy research and as for the purpose of the tests, British also includes Scotland, so it all made sense to me. But then I looked at my Irish number. Wait a minute. 6% seems a little low. All my life I believed my grandfather on my mother’s side was purely Irish and that we had a strong connection there. I should be 25% Irish. 6%?! But then I started thinking about everything I’ve uncovered so far. It is true that my great-grandfather William Richard Hyde came to Canada when he was a very young boy from Ireland. At 5 years old, he arrived in Quebec on June 13, 1876 with his brother and his mother, Eliza Jane Mitchell. He spent the rest of his life here, marrying a local girl named Mary Ann Marcy whose family has roots in England. 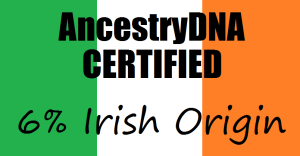 So if my great-grandfather is Irish, shouldn’t my DNA be at least 12%? This is how I came to resolve a mystery I had been having for a really long time about my family. My great-grandfather was only half Irish. It was staring me in the face and it made so much more sense than I ever imagined. I’ve done some research on that side of the family, well as much as I can since a large amount of Irish records have been destroyed unless you go there and hunt cemeteries. It always perplexed me how online records would show up for an Eliza Jane Mitchell (my 2x great grandmother) being born in England but nothing in Ireland. Perhaps she actually isn’t Irish after all. It’s a bit heartbreaking to me. I know that it shouldn’t be, I mean, it isn’t like my life has really been affected in any major way. My Irish roots are formed from a very specific family line, one in which I have very little information on. I’m a Canadian through and through but I really thought I had deep Irish roots. I have the name of my 2x great-grandfather Henry Hyde but no other details. It’s a dead end and leaves a large hole in my tree. This St. Patrick’s Day I’m proud to be 6% Irish but I’d be lying if I didn’t say I want to know more. In light of St. Patrick’s Day, many people around the world start looking at trying to research their Irish heritage. I think it’s a fantastic idea, but might be much harder than anticipated. The political climate in Ireland has caused some major issues for those wanting to track their Irish genealogy. Many of the record buildings have been bombed as part of all the unrest in the country and many of the national archives are gone. Add to the records being bombed, burned and destroyed, the people in Ireland had no clue how important these records could be to people in the future wanting to trace their roots and some of the papers were not stored or kept. When you bring in the potato famine from 1845-1852 and 1 million men, women and children lost their lives and many more migrated away from Ireland to find better lives elsewhere, it makes it even harder. Knowing my family came to Canada, and knowing the Canadian immigration rules around this time, it is hard to know exactly where my family came from in Ireland. Canada was part of the dominion of Britain. if you were a citizen of a country in the dominion, you weren’t required to provide any documents when travelling. For my ancestors, it was easy enough to put “Ireland” on the ships manifest, get off the boat and collect their bags. Nothing else was needed to start their new life in Canada. This is why I need to go to Ireland. I need to scour church records, cemeteries and try to track down my Hyde’s and Mitchell’s. However, Ireland has a lot of churches and a lot of cemeteries. Where can I even begin?